Just when we thought we had established a beachhead in the battle against the dreaded Asian longhorn beetle, along comes another deadly pest to terrorize our urban forests. 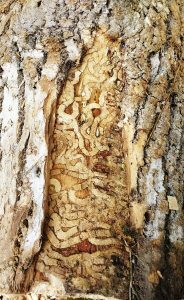 As Phil Lameira reported in this newspaper four years ago, the latest participant in the parade of tunnelling chewers assaulting our trees is the well-publicized emerald ash borer, which, as its name suggests, is a devastating insect that has been invisibly chomping away at ash trees throughout the GTA. The pest has been around for a while, making its North American debut in the Detroit area in 2002, where it probably escaped from contaminated lumber imported from its native Asia. Since then the spread of the insect has been blindingly swift and the threat has now escalated to one of the worst epidemics to hit a single species in North American history, killing millions of trees in the United States, Ontario and large areas of Quebec’s western townships. Only ash trees are fodder for these brightly coloured beetles – except for the mountain ash Sorbus aucuparia, actually a member of the rose family – and it doesn’t take long for infected trees to die. Native ashes can be killed in as little as 12 months with larger, healthier stock sometimes hanging on for two or three years before they finally succumb. The winged emerald-coloured adults emerge from tiny ‘D’-shaped holes in the bark of a host tree in May and June and as expert aviators can fly three or four kilometres to mate and lay their eggs in small cracks in the bark of ashes within their range. The mature adults are relatively benign and do little harm, other than feeding on upper leaves. The real damage and fatal blow is delivered by their larval offspring, that bore through the cambrium layer just beneath the bark, where they literally strangle and starve the ash to death by destroying the phloem, one of the essential circulatory vessels needed to transport water and nutrients throughout the tree. By the time cracks and fissures appear in the bark and there is a noticeable increase in woodpecker activity hammering away at the trunk looking for a meal, it is too late to be saved. If the victim’s bark is peeled back you will notice complex serpentine patterned galleries where larval feeding has taken place. There are treatments available to battle the bug, although their long-term effectiveness is unclear. The most popular is TreeAzin, a systemic insecticide derived from neem oil that is injected into the vascular system to prevent larvae maturation. However, this expensive treatment has to be administered by a certified arborist every two years for the duration of the insect threat, and is only effective on trees that have not yet been infested. 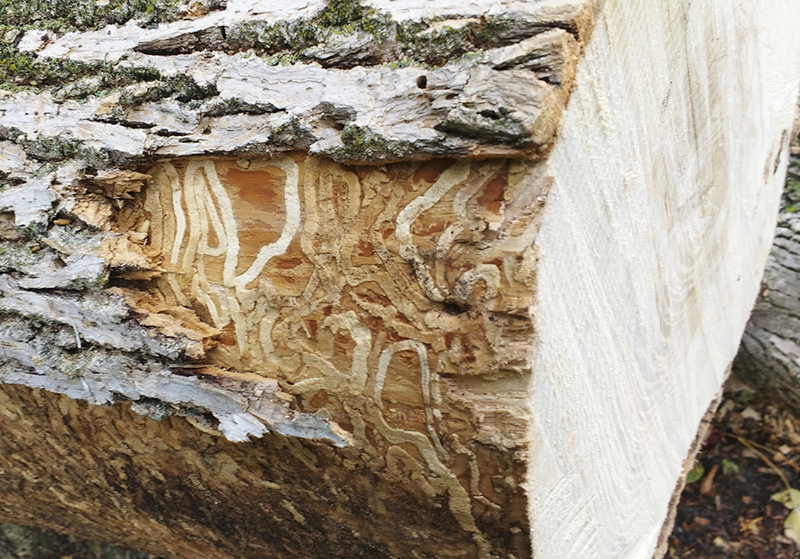 In the GTA crews of arborists armed with chainsaws and chipping trucks have been the infantry in the war against the bugs over the last few years, with the bulk of the work being performed September through April when flying adults are inactive. For safety reasons the primary focus has been to target dead and decaying ashes in public spaces, but tragically most – if not all – ash trees in the city will eventually have to be removed. That is no easy task since it is estimated there are more than 850,000 of the trees in Toronto parks, street plantings and on private property. And if an ash is not yet infested, it soon will be. While this may all sound like doom and gloom (and it probably is), Mother Nature usually has a way of taking care of herself. In time some of the stumps of the felled trees may send up saplings from remaining roots and newly opened canopies may give reforestation plantings a better chance to become established. The inner sapwood and heartwood from freshly cut ash trees is unaffected by ash borers and while it can’t be transported beyond defined quarantine zones, it is highly desirable among carpenters and cabinetmakers, so at least some of our ash trees may make it into antiquity.